The table shows results using the right gripper suited for each one of the diameters. 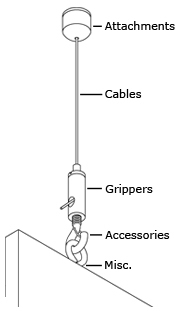 Please note that there are exceptions for some type of grippers regarding breaking and recommended load. If you are unsure about how to choose the different parts for your suspension system, please contact us for technical support. Each value shows the diameter of the cable. Each value shows 1/5 of the breaking load and are for guidelines only. This is the value you should be looking for when choosing cable diameter for your suspension system. Each value shows the weight when the cable/gripper combination breaks. Improper installation and wrong choice of components may give undesirable results.